I'm cravin' me some: Crushed velvet old-fashioned grandmother sofa action. This is such a dreamy couch. I love the pillows but I also hate them which sounds funny but it's true - they are bad but oh so good! The wall color is also quite amazing. This photo is from Shitery. 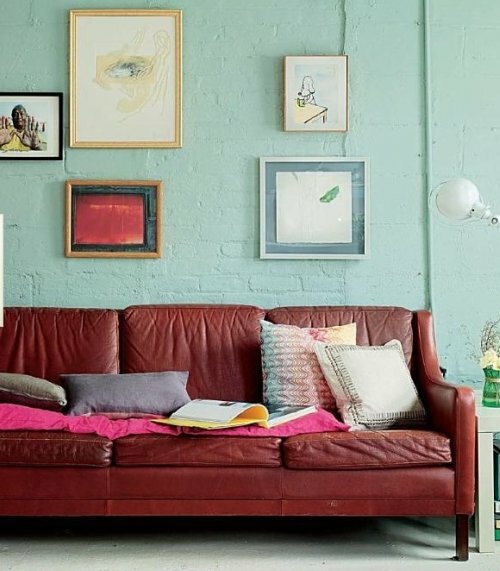 I'm feelin': The minty green brick walls, the orange-y leather sofa that is definitely vintage, the spacing between the art work on the wall - it's not tightly grouped, it's relaxed and very no-frills. This photo is from New York stylist extraordinaire, Lili Diallo, via google images. I'm likin': The shelves, the art and the unexpected pattern on the sofa. 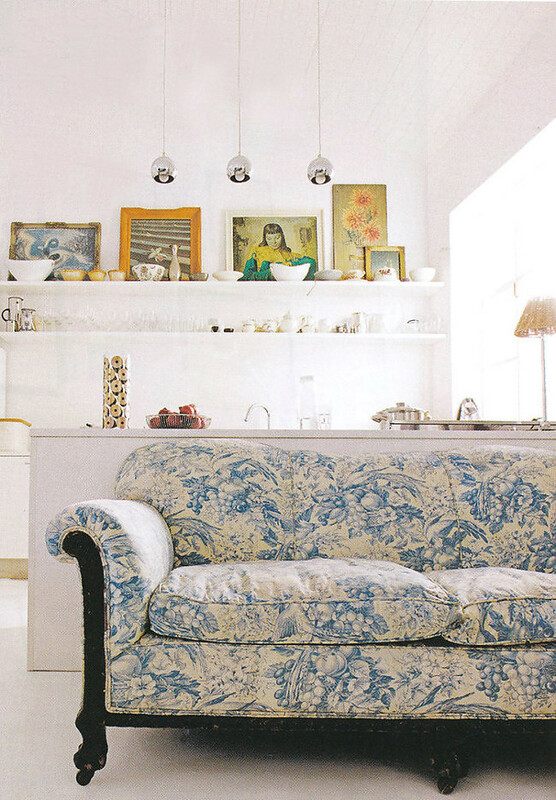 This is Shelley Street's home in Real Living magazine, scanned by Dust Jacket Attic. Photographed by Martin Hahn. I'm swoonin' over: The light in the left corner - I keep seeing them in German magazines - must find source! The concrete floors which is currently a love of mine... I like how easy breezy this place feels - it's totally beach cottage meets urban industrial. 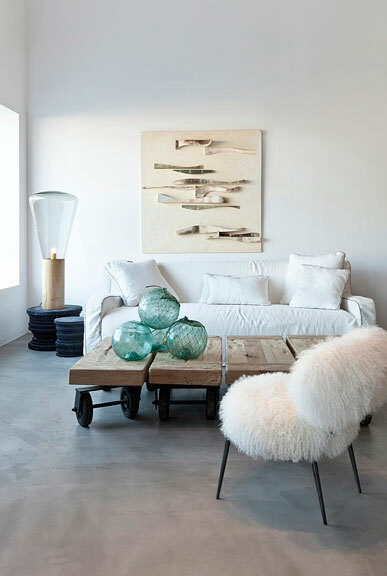 Love the furry yeti-ish chair and just about everything else going on in this space. Sometimes a room has more of a mood happening over anything else that attracts me to it. This place says Style Without Effort. I like that. Photo from Home is where the heart is. 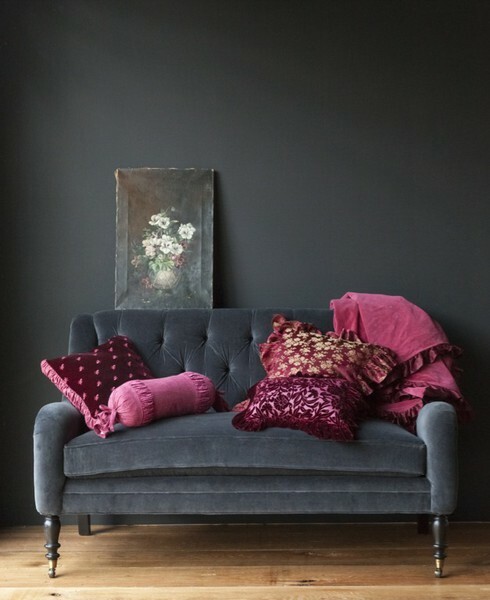 I'm diggin: The whole moody energy here - the wall color, the sofa style and color, the shot of fuschia and the painting leaning against the wall. 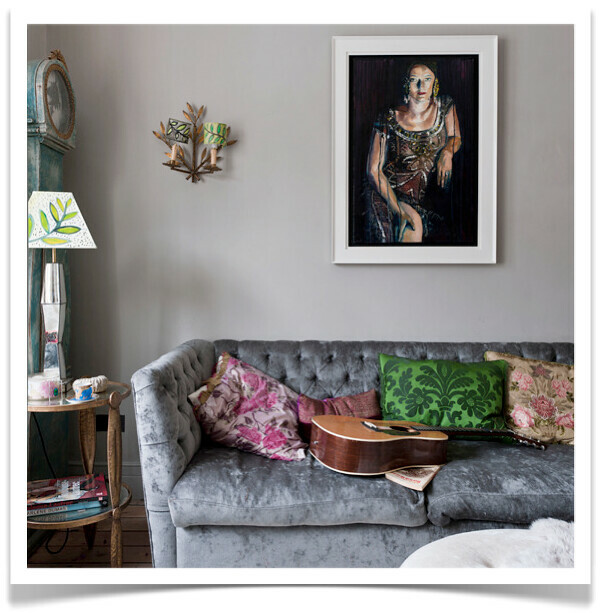 Of course, this is a styled shot - you couldn't live with a painting propped against the wall on the back of your sofa because it would fall but you could also hang it on a wee nail just a bit higher but still keep it very low to the sofa in the off-centered position as it is currently. Photo from Fey Handmade. I'm all for: The gray walls and the wall they've nestled that L-shaped sofa into to make a cozylicious corner, it's very nice there and the white shelf with the art makes for a lovely gallery-in-rotation, which is perfect for Etsy print collectors to move stuff around without hammering into the wall each time I decide to change things up! Like the yellow accents, too. Photo from Angelica Gonzalez. This is kickin': Okay how cool is this anything goes approach to decorating, huh? I'm liking this eclectic bohemian mama look a lot. This is from Matchbook magazine. This place is rockin' out some major 'tude. It's like, "Yeah, I live here and I love all of this stuff so deal with it." I'm happy to deal with it - it's quite pretty. 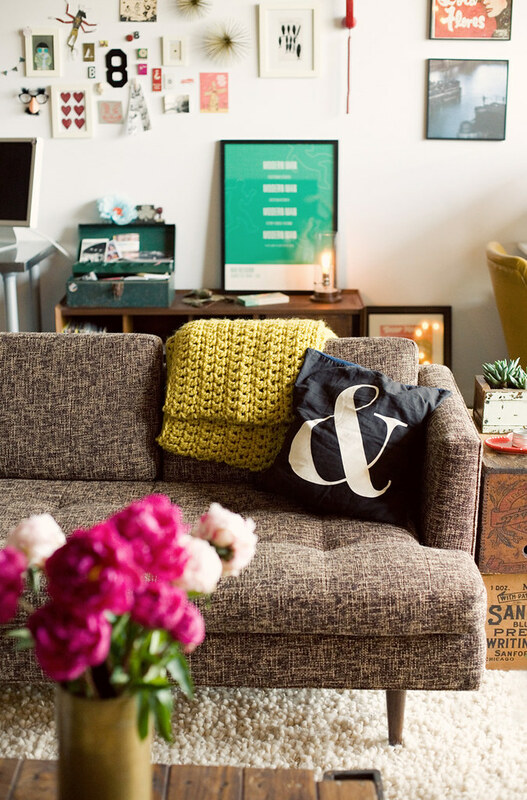 Major love here: This is Bri Emery's living room loft space in L to the A. It's nice, right? 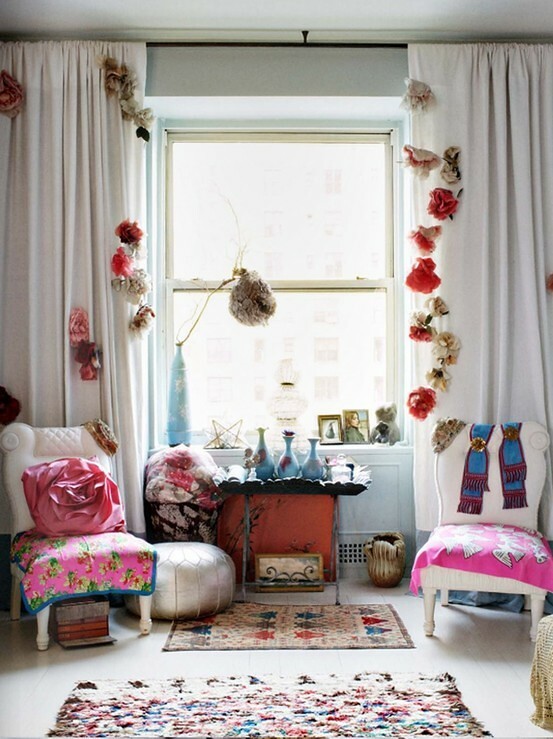 I love the sofa style and fabric and the wall behind it - so much personality! It was shot by the super amazing Bonnie Tsang, who I have a major girl crush on at the moment because Bonnie downright rocks it out with her whole great eye camera goddess thing. When I taught mood board workshops for Anthropologie stores last year, I stressed that when building a style file to always make notes in it detailing exactly what you love about the magazine tear that you've pulled. That's why I've done this as an example with each of my tears above. Sometimes you'll find that there are only a few elements and then you can start to notice definite themes which then lead to finding your personal style or at least what you're into at the moment. From my looks above it is obvious that I have a real thing for gray walls at the moment and pretty sofas and gallery walls. I wish you all a wonderful weekend! I will see you soon again on Monday... Loads of hugs - I'm off to Paris soon until Tuesday night so I'll be blogging from Paris for a few days next week. You can also follow me on Instagram while I'm there, my Instagram user name is decor8.